Depending on the variety, figs taste of three basic flavors: berry, honey, and sugar (plain). The pulp colors match the flavors, as do the skin colors to a lesser extent. Sugar figs tend to have amber/brown pulp, sometimes ranging to red, with dark skin of various colors. Honey and agave figs have golden and yellow pulp, sometimes ranging to caramel, with light skin, usually yellow. Berry figs tend to have red pulp sometimes ranging to purple, with dark or light skin. Close-up focus on fig pulp in 10 modes at “Fig Flavor by Pulp“. Also see “Fig Ripening Order & Short Season Tips” and “Fig Skin Color Spectrum“. In the flavor, pulp and skin color spectrum of figs, things can get complicated quickly. With a spectrum marked off by modes of 10 flavors, and 10 pulp colors, and about that many skin colors, simplicity and clarity is aided by keeping the focus on the 3 core flavors of Berry, Honey, and plain Sugar, and noting the in-between flavors. It’s simple and conveys the gist. That said, even the main Berry flavors, Honey flavors, and Sugar flavors, let alone any in-between flavor notes, can and do vary a lot depending upon cultivar, growing conditions, and climate. The flavor of a fresh ripe fig picked off a fig tree or bush comes primarily from the pulp, which has a gel texture of various consistencies. Also adding some flavor and texture is a thick or thin fig wall and the skin, which may be light or dark colored. There may or may not be some mild wholly edible tiny seeds that crunch. In describing the main berry mode of figs as Berry, what is actually meant is Strawberry, Strawberry-Plus, or Strawberry-Mix. The strawberry flavor is often mixed with resin and various types of berry and fruit notes and sugar flavors, while the basic flavor remains a kind of strawberry jam, jelly, gel. 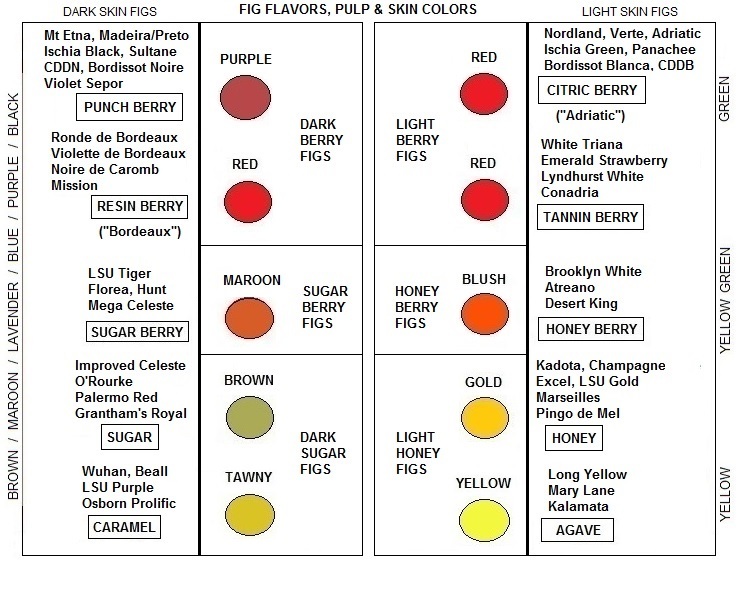 Berry flavor figs include Black Madeira / Figo Preto, Mt Etna, Bordissot Noire, Col de Dame Noire, and many others. There are several categories of strawberry flavor figs: Resin Berry, Punch Berry, and Citric Berry (aka, Bordeaux, Berry or Dark Berry, and Adriatic), also Tannin Berry. However, the flavor modes between these various strawberry based figs and the various honey and sugar based figs – sugar-berry and honey-berry – do not always refer to sugar-strawberry or honey-strawberry flavors, and can frequently refer to various other berry flavors. What is meant by the in-between “berry” description is often a generic berry or fruity taste, as there are a lot of types of berries that taste basically of an almost indeterminate or general fruity flavor, or a varied berry flavor. Certain figs are more figgy, resinous, than others, and a few cultivars – the “Bordeaux” types in particular, Resin Berry – may have more resinous taste, or aftertaste, than most. In some figs, sheer sweetness overpowers any resin taste, while in other figs the flavors seem simply light and resin-free, as with some honey figs or with acidic and fruity berry figs. Ronde de Bordeaux, Violette de Bordeaux, Mission, Noire de Caromb, and the like, seem to have a more resinous flavor than typical, an aged or molasses-caramel flavor, sometimes described as figgy. Certain green skin, red pulp figs may at times have a somewhat bitter (tannic) taste that seems to come from the skin, or just beneath it: Conadria, White Triana, Lyndhurst White, and Emerald Strawberry (143-36), for example. These figs may be considered a light skin counterpart to the dark skin “Bordeaux” mode, tannin berry to resin berry. When well ripened, tannin berry figs are large sweet and juicy berry figs with light green skin and reddish pulp. The skin may tend toward yellowish tints, and the pulp may have either a more brown cast or be a lighter shade of red, with a more translucent look than the several modes of deeper red pulp. The striking cheery look of bright green skin and dark red pulp is characteristic of Citric Berry (“Adriatic”) figs. The flavor is typically an intense strawberry, especially sweet and complex. There is often little resinous edge. Instead, there is more acidic or citric tang. Like sugar cookies, sugar flavor figs have a relatively plain sweet taste, though often with a noticeable resiny edge. While the resin flavor or tannic flavor of figs is pronounced in the resin berry (“Bordeaux”) figs, it may be more noticeable in the plain sugar figs (due to little or no masking flavors). The sugar figs are good and sweet, but may seem less agreeable than all other flavors for the 2 reasons that a sheer sugar taste can be plain, while a resinous/tannic flavor can be biting. On the sugar-berry side of the pulp and flavor range are fig cultivars that are neither fully sugar figs nor fully berry figs and are commonly a mix of the two, sugar-berry. These dark-skinned figs have a light generic berry or fresh fruity flavor compared to the true berry figs’ intense flavors. They have fruit juice flavors, somewhat resinous, as opposed to berry jam or punch flavors. Sugar-berry cultivars include LSU Tiger, Florea, Hunt, and others. On the other side of the spectrum, between Honey and Tannin Berry, the flavor tends also toward berry and also becomes fruity but in a less resinous way and with more of a honey or agave kick. Honey-berry or agave-berry describes the flavors of those figs in between the more focused Honey and the more focused berry flavors. Along with sugar-berry and honey-berry, sugar-fruity and honey-fruity might help clarify what is meant by those “in-between” flavors. The skins of the honey-berry figs tend to be greenish-yellowish with light red and translucent pulp. Cultivars include Conadria, White Triana, Lyndhurst White, Brooklyn White, and others. Their pulps are darker than pink, lighter than berry red, partly honey, partly berry flavored. Occasionally, pulp can range to golden or to dark red. Mainly, the pulp is light red. Tasting more of juice than of jam, these figs have fresh, light berry flavors compared to the intense berry flavors of the full berry figs. On the sugar-honey leg of the flavor-pulp-skin triangle are dark skin figs such as Wuhan, LSU Purple, and Beall that have tawny pulp ranging between beige and orange. “Caramel” as a mid-range flavor descriptor between plain Sugar and Honey may be confusing, as these figs can more often have a light caramel color than an actual caramel flavor. However, sugar-honey as descriptor would probably be more misleading since the flavor is not a sugary honey but rather a collection of flavored sugars and vague or especially mild honeys. The maple sugar flavor of mature LSU Purple figs, for example, seems to have no fruit note. It’s an off-sugar fig, a flavored sugar fig with light somewhat honey-like pulp, so fits well as an in-between sugar and honey flavor. Honey itself can be thought of as a flavored sugar with little or no fruit note. The purest of the light figs are a kind of honey fig, the agave figs such as Mary Lane and Long Yellow. These figs have agave-like flavors and some of the most light and bright colors of yellow skin. “The nectar made from the plant [Agave] is known in Mexico as aguamiel, or ‘honey water’.” And the purest honey figs taste of agave syrup or nectar, a thinner, lighter, or more neutral taste than honey. In the range between plain sugar, flavored sugar, agave, and honey flavor, no fruit is featured, though somewhat fruity flavors may occur. This part of the fig flavor spectrum mainly runs between plain sugar, flavored sugar, honey, and agave nectar. The more one moves from dark to light in figs, the less resinous bite and tannic complexity seems to occur, though there emerge other kinds of complexity that may be more acidic, fruity, or spicy.